A PDF version of this Newsletter can be downloaded for printing – please click here. In this issue we include a report on our summer concert, and details of a variety of events which will take place over the next few months. 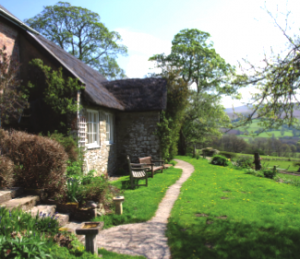 We look forward to welcoming a Quaker Voluntary Action team over the first August weekend, who will be engaged in gardening and other useful activities to keep the Pales and its grounds in good order. Our autumn activities are a response to some of the requests put forward by those who have attended recent events. We will welcome your suggestions for activities in 2019 – more news on these soon. 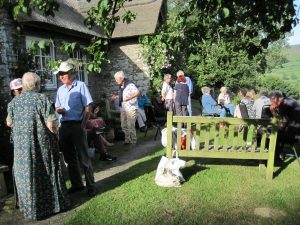 On Saturday 23rd June thirty of us gathered in the glorious sunshine for a picnic tea.We then entered the meeting house for an eagerly anticipated concert of poetry and song by two Friends, Fiona and Gorwell Owen, who had come all the way from Anglesey to entertain us. 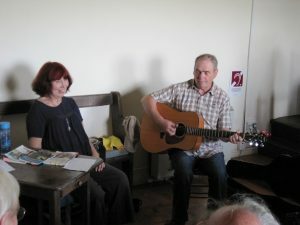 They played a selection of songs from their recorded albums, including folk songs in Welsh and English, and two covers by their favourite bands PG6 and Low. Two of the songs were settings of poems by Welsh-language writers Aled Jones Williams (‘Rhwng’/’Between’) and Quaker poet Waldo Williams (‘Eirlysiau’/’Snowdrops’). The songs were interspaced with Fiona’s reading of poems from her books The Green Gate, Screen of Brightness and Going Gentle. A wonderfully varied evening, thoroughly enjoyed by all. An opportunity to increase your awareness of the natural world in all its variety. Discover the patterns and colours around you. Interact with what you find. Silence lies at the heart of the Christian spiritual tradition and is the major feature of Quaker worship. Come and explore how to use silence and discover how it draws us closer to God and one another. Dominic is a member of an Anglican Religious Community called the Oratory of the Good Shepherd that seeks to combine a consecrated life of prayer with pastoral ministry. 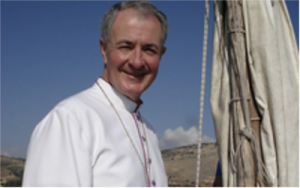 He has worked as a parish priest, superior of his community and a bishop in England and Wales. He now looks after an allotment and his dog but says he is still learning to pray and he is still fascinated about God. Rather than just talk about prayer Dominic plans to actually give some time to doing it! He will talk about Lectio Divina and then give people a bible passage with which to pray and move them on through the various stages. He will also do something similar with modern Centring Prayer based on The Cloud of Unknowing, and lead a time of contemplative imagination in the Ignatian tradition. This will give people an experience of various ways of praying and enable them to see if any of them work for them. It would certainly be ‘teaching’ rather than a formal academic lecture. After the lecture Dominic has agreed to respond to questions. Tea and cakes will be provided with an opportunity for informal conversations. Tickets: £6 in advance (£8 on the door) through the Pales website, or you can pay at the door. There will be a talk and discussion in the morning , from 11. a.m., and an exploration of the quarry in the afternoon (2 – 4pm). No booking needed. Donations will be appreciated. Explore and experience Universal Sufism at the Pales,including Spiritual Song and Movement with Karim Hadden. In this day we will come together to explore the theme of Universal Sufism drawing from the teachings of Hazrat Inayat Khan and others, including spiritual poets such as Rumi and Kabir. Universal Sufism honours all the spiritual traditions of the world and emphasises the unity of religious ideals. It is an experiential path which does not insist on specific beliefs. During the day we will weave together presentation, discussion, meditative practices, spiritual song and movement. Everyone is welcome and no special abilities are needed. Everything will be explained in a simple and relaxed way and you will be encouraged to take part in whatever way is best for you. These are spiritual practices which help us in the ‘Tuning of the Heart’ and to this purpose we can all contribute by our presence. Wednesday 24th October 10.30 – 4.30 Bring vegetarian food to share for lunch. Cost: £20 (Concessions: £15, If you need a further concession please ask: No one turned away through lack of money) Please book in advance through the Pales website. 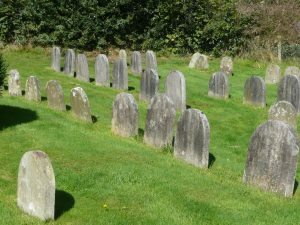 The Burial Ground at the Pales is one of the oldest Quaker graveyards in Wales, and certainly the oldest still in use. The exact date of the first burial is not known, but its use goes back to the early 1670s. Early burials were not marked by a headstone, as this was not the practice of early Friends. The oldest headstone at the Pales is dated 1838, and belongs to John Jones, of Little Park. As this is only a nominal cost, any further donations towards the upkeep of the grounds and historic meeting house at the Pales would be appreciated. The Pales website has a listing of all recorded burials at the Pales, under the History menu. The list covers all known burials up to 1966; more recent burials are excluded. 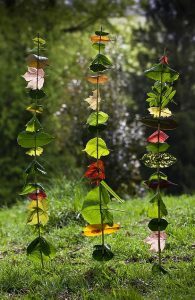 Green Art at the Pales – Thursday 9th August. 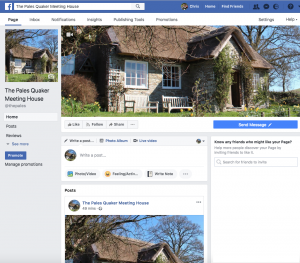 The Pales leapt from the 17th Century to the 21st Century this week when we started our FaceBook page – https://www.facebook.com/thepales or search for The Pales in the FaceBook search. Our aim is to spread the news of events at the Pales to a wider audience by adding the FaceBook icon to publicity. It will carry the same information as the newsletter but we will publish it immediately rather than monthly. What is missing from this picture? There are no prizes for spotting that the manure heaps have been moved from the farmland below the Meeting House. 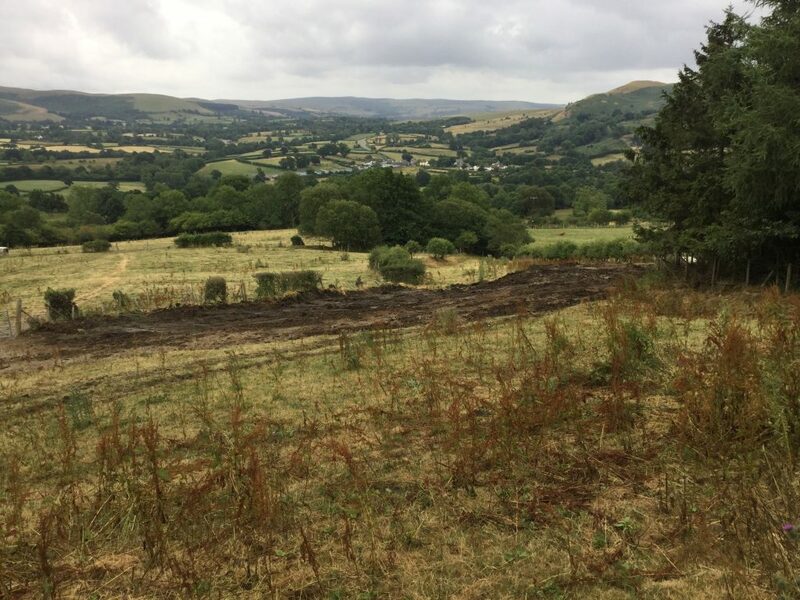 Good relations between our Friend in Residence, Carole Chapman, and the local farmer allowed a negotiated removal of the unsightly (and, in hot weather, odiferous!) piles. They are now spread far and wide and new dumps will be established further from the Pales.